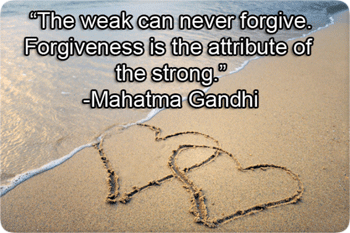 Have you ever struggled with forgiving someone for a wrong they’ve done to you? Don’t let holding onto this resentment make you fat AND unhealthy. I was listening to a local sports talk radio station the other day, and the conversation took a very interesting turn. They asked all the listeners to call in if they fell into one of the two following categories. Category 1: Those who held a grudge or had resentment towards somebody in their life that had hurt them, so they refused to forgive them. Category 2: Those who had somebody else in their life who was holding a grudge or resentment against them for something they did wrong. – Fathers and sons not talking for years at a time. – Mothers and daughters not being able to end the drama, or fighting for months on end over something petty. – Families divided because of something as stupid as what somebody else said. One of my aunts on my mom’s side of the family “divorced” (figuratively speaking) all of us years ago. She sacrificed missing out on years of celebrations, loads of laughter and tons of memories, while not even caring if she saw her nieces and nephews grow up. All because she has resentment and doesn’t know how to forgive. I’m sure you’ve experienced both of these categories in your life at one time or another. For several years I held a huge grudge against the mother of my daughter for past hurts. But I eventually realized that life is too short for this nonsense. Listen, those who have hurt you in the past cannot continue to do so unless YOU hold on to the pain and resentment. Even the story of Judas from the Bible clearly reveals the power of forgiveness. It would be hard to find someone worse than Judas. The bible says “Judas… was a thief.” (John 12:6). Somehow he was able to live with Christ and witness his miracles, but in the end he decided he would rather have money than a friend. So he sold Jesus for thirty pieces of silver. Judas was a scoundrel. A cheat. A bum. How could anyone see him any other way? I don’t know how, but Jesus did. How in the world Jesus saw Judas as worthy of being called a “friend,” I can’t even imagine. But in that moment Jesus saw something good in a very bad man. Shouldn’t we do the same for those who hurt us? This is hard advice to swallow when we’re bitter, angry, or hurt. But research and science shows that your lack of forgiveness or holding onto resentment could be making you fat AND unhealthy. 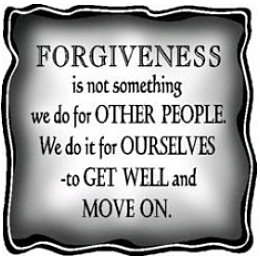 STUDY #3: Showed people who are taught how to forgive become LESS angry, feel LESS hurt and are MORE optimistic. People who forgive are even more self-confident. – The first to apologize is the bravest. – The first to forgive is the strongest. – And the first to forget is the happiest. It’s another secret to living every day with your best body and life.